We love festivals and we love filming Weddings on Vancouver Island. We also love Pimms (especially Danielle), dancing in fields, rope swings, vintage cars and good natured people who are clearly in love. Ian + Anna = top 5 weddings for sure. The site of British Columbia’s First Ever Wedding! Ian and Anna were married on Anna’s family farm in the village of Mechosin near Victoria on Vancouver Island. It’s a beautiful property set between the ocean and the forest where they grow lavender, honey and other goodies. Its also the very same farm that the first EVER (non first-nation) wedding in British Columbia. It occurred way back in 1855 between a Martha Chaney and Captain Henry Ella. How cool is that little history nugget? We loved the inclusive nature of the day, with friends and family camping on-site and all pitching in to get everything in place. We really believe that having your guests invested in the wedding adds so much to the day. As with destination weddings and multi-day events everyone gets to know each other a little more, they feel that they’re part of something bigger and ultimately, they just have more fun. There was also so much to explore as you moved around the site. The giant rope swing always comes to mind when I think of this wedding. Then there’s the tipi’s, the pimms bar, the red vintage car and the walk through the forest to the ceremony site. Later on there were games, sing-alongs and that fantastic party. There was just a really free-flowing feel to the day and it put everyone in a very relaxed and festive mood. We loved filming this wedding, but you know what? We secretly wished we were guests! Some of the best Wedding Vows. 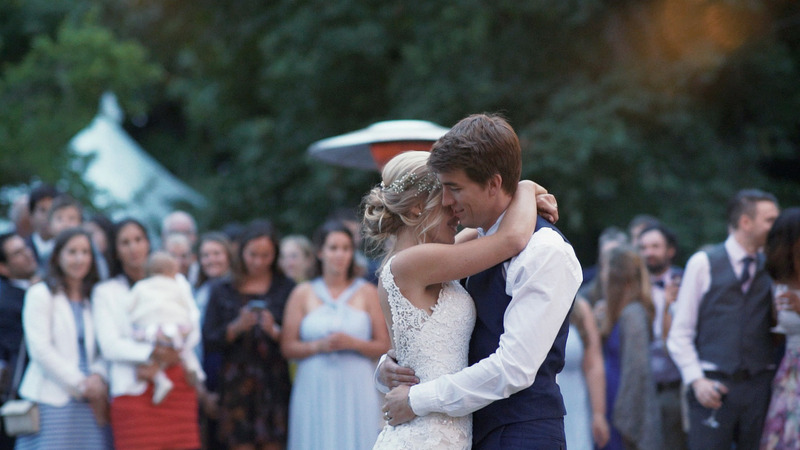 We had to open the film with Anna and Ian’s vows which set the tone perfectly.“I have dreamed of this day since I was fourteen years old, though I never truly expected it to happen….” immediate’y gives us a sense of where their journey began. They’re childhood sweethearts who admired each other from afar before finding their way to each other. Their vows reflected the sweet nature of their personalities and the deepness of their love. Ian’s words “…every chance meeting, I’d be overcome with a strangely wonderful combination of butterflies and calm…” perfectly sum up that giddy feeling of falling in love with your soul mate. When you write your vows you have the chance, not only to make a promise, but to tell the world your story. We know Anna and Ian love each other, but their words are a glimpse to something much deeper. We’re treated to a story and its a revelation to hear their personal feelings expressed so beautifully. These guys are a great example to all future vow writers. Take note…..
OH MY GOD YOU ARE A VIDEOGRAPHY WIZARD!!!!! THANK YOU SOOOOOOOO MUCH!!!! WE LOVE IT!! holy cr*p you’re so good at videography and story telling and putting it all together!!! INCREDIBLE WORK!!! Besides all our caps locks we are speechless – you’re amazing!! Thank you!!!! Please take a look at more of our films here. Keep up to date with our latest news and work on our Blog. And Contact Us to learn more about our Cinematic Wedding Videography!